Are men from Bordeaux and women from Burgundy? In my 20 years of studying and writing about wine, I’ve encountered a lot of differences in how men and women approach the subject. There are also several studies that show the same thing. 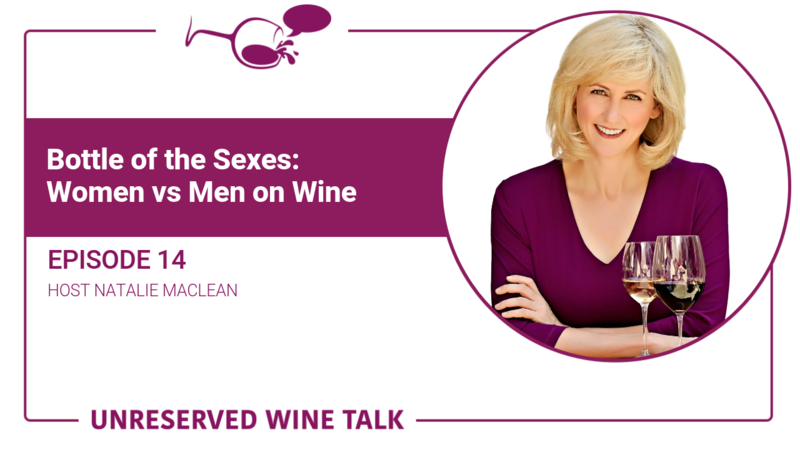 In honour of International Women’s Day this week, I’m diving deep into “women’s wines”, whether they’re actually any good and how wines marketed to women are affecting the industry. Are the “chick wines” on the market any good or are they simply marketing gimmicks? What are my thoughts and tasting notes for three of the most popular wines marketed to women? Does the data show any differences between men’s and women’s wine habits and preferences? Do men or women make better wine tasters? What has my experience been with the different approaches to wine from men and women? Are these marketing gimmicks targeting women harmful or helpful to the industry? Welcome to episode 14! In honour of International Women’s Day this week, why don’t we chat about those so-called “women’s wines” (did you hear those air quotes?). But before we get started, I’d like to give a shout out to Kim Bedell of Dawson Creek, BC, who emailed me about episode 7 with New York Times bestselling author Bianca Bosker. If you missed that one, go back and have a listen as she’s hilarious and smart as all get out. I’m thrilled that this episode brought you back to Riesling Kim! It’s such a fabulous wine, and as you say, it doesn’t have to be sweet. I love to share reviews of this podcast for those of you kind enough to post them on Apple podcasts, social or email. If you want me to mention your website or social media handle, please include that in your review, along with your name. I want to celebrate you and let others know how to connect with you online! As you know by now, I love tasting and writing about wine with my tongue in cheek. So when it comes to wines aimed at women, I have to throw up my hands and admit that I just can’t resist a pink label or cuddly squirrel. I guess I’m just at the mercy of those intrepid marketing teams … it’s like they read my mind after I’ve been drinking too much of Two Hands Gnarly Dudes Shiraz. Girls just want to have fun right? Maybe, but grown-up women need a drink. A flurry of “chick wines” are on liquor stores, including Mad Housewife, Mommy’s Time Out, Happy B*tch and Working Girl. The best label in the Working Girl line-up is Handyman Red, presumably for those Desperate Housewife afternoon tumbles with the plumber. But do these wines taste good, or are they simply marketing gimmicks? I gave three of them a stern look and taste. Girls’ Night Out Riesling, Ontario: A light, tasty white with a touch of sweetness and notes of peach and pear. This is one of the most successful brand launches from the southwestern Ontario winery Colio Estates. It makes a lovely aperitif while watching Eat, Pray, Love. Pair with roast chicken and white-fleshed fish. $13 Score: 85/100. Little Black Dress Merlot, California: Okay so what’s up with red shoes and white soles on the label? That’s so 2018. However, this wine offers juicy cherry and blackberry aromas. It’s medium-bodied for nice girls, but also has a knock-it-back tastiness for the naughty. Drink it with veal, pork tenderloin and while practicing your presentation for the hostile corporate merger. $15 Score: 87/100. Cupcake Red Velvet, California: Try to move past the reference to the girly frosting cake. This blend of zinfandel, merlot and cabernet offers enticing aromas of dark berries, cassis and black plums. A juicy steak, hamburger or prime rib are all great matches, but wait, aren’t those rather macho meals? Manly yes, but I like them too. $15 Score: 87/100. You’ll find links to all of these wines in the show notes at nataliemaclean.com/14. So let’s dig deeper here. Perhaps the problem started with Bacchus and Dionysus, the ancient Roman and Greek gods of wine, both men. Or maybe it was the medieval European myth that women could turn wine to vinegar. Possibly it’s the modern misconception that women don’t like to get their hands dirty. As my finance professor at Western used to prompt us: what does the data say? Women buy 80% of wine, and consume 61%, according to The New York Times and several studies. That’s because women purchase most household goods (still) from Shreddies to SUVs and are the social planners, whether it’s a dinner party or a casual get-together with friends. As a woman who writes about wine, it doesn’t surprise me given that wine is the drink of conversation, to be savoured and enjoyed with friends over dinner rather than knocked back as shots in a bar. Women are more interested in pairing food with wine, and are considered to be better tasters: we are the majority of supertasters in the population, including yours truly. Yes, I had my taste buds counted by California-based Tim Hanni, a specialist in sensory analysis. Women are more adventurous and experimental when it comes to wine, more willing to try new brands, and more apt to order by the glass in a restaurant. A Globe & Mail report says that women have been driving wine sales up over the past decade in Canada. The article says that Canadians are drinking 12 percent more than they did a decade ago, according to Statistics Canada, and industry watchers are attributing a significant portion of the increase to women. The large rise in consumption is thought to be the result of a number of factors: a broader product assortment that tends to attract women, successful marketing strategies targeting both sexes, and boomers who are experimenting with more sophisticated ways to entertain. Beer sales in Canada have been consistent and Statscan says it is men who tend to drink that beverage. Wine sales, however, have tripled in some parts of the country. Alan Middleton, a marketing expert at York University, largely attributes this boom to women. Professor Middleton said that as retailers expanded marketing campaigns for wine and mixed drinks over the past decade, women consumed more of those beverages as alternatives to filling, harsher-tasting beers and brown liquors. Women buy wine to please guests, men buy to impress them. Women are more about sharing wine, men are into cellaring aka hoarding. Women tend to ask for recommendations and guidance more so than men who tend to act as though they already know about wine … hmmm, when we’re lost on vacation, who’s going to ask driving directions? I get several hundred emails every day from the 268,000 subscribers to my wine newsletter, many of them from women asking about how to pair wine with food or how to serve it (glass, temperature etc). So are men from Bordeaux and women from Burgundy? Maybe, but of course, these are generalized findings from various studies, and there are always exceptions. However, I do find that men approach wine more analytically and women more holistically, based on the questions and comments I get on social media as well. Men are far more focused on the trophy or badge wines and women on the stories behind more mid-market wines. Of course, all sorts of products are marketed to women differently from the way they’re marketed to men, from computers to clothing. Marketing is also based on race, ethnicity, age and geography. With more than a million wine producers worldwide, I understand a winery’s need to stand out on crowded liquor store shelves. However, I’m always skeptical of marketing-driven wines. Authentic wine has its roots in the ground, not in a focus group. Do I find the high heels and little black dresses insulting or dumbing down women’s knowledge of wine? No, I find many of them sad and pathetic, in an unimaginative way. But I have to remember that I’ve spent more than twenty years reading and writing about wine and that for someone new to wine, it can be extremely intimidating. If these labels help women or men try wine and explore other wines as a result, then that’s a good thing. The saving grace is that first sale of any wine is often based on the label, but the second sale is always made on what’s inside. So perhaps it’s time that Bacchus and Dionysus made room at the table and in the cellar for a colleague: Varunani, the Indian goddess of wine. I raise my glass to her, and to women and men who love wine and enjoy it together. How about you? How much are you influenced by the wine’s label? Are there any girly-girl or pool boy wines you’ve tried and enjoyed? Share that with me, please! You can tag me on Twitter or Facebook @nataliemaclean, on Instagram I’m @nataliemacleanwine or use the hashtag #unreservedwinetalk. You’ll find links to the wines I’ve mentioned in the show notes, at nataliemaclean.com/14. Next week, we’ll chat with sommelier Lesley Brown who shares her best tips on how to choose from a restaurant list. If you liked this episode, you can share it easily by taking a screenshot and texting or emailing it to a friend. I can’t wait to share more personal wine stories with you. Thank you for taking the time to listen to this one. I hope something great is in your glass this week!